Welcome back everyone. 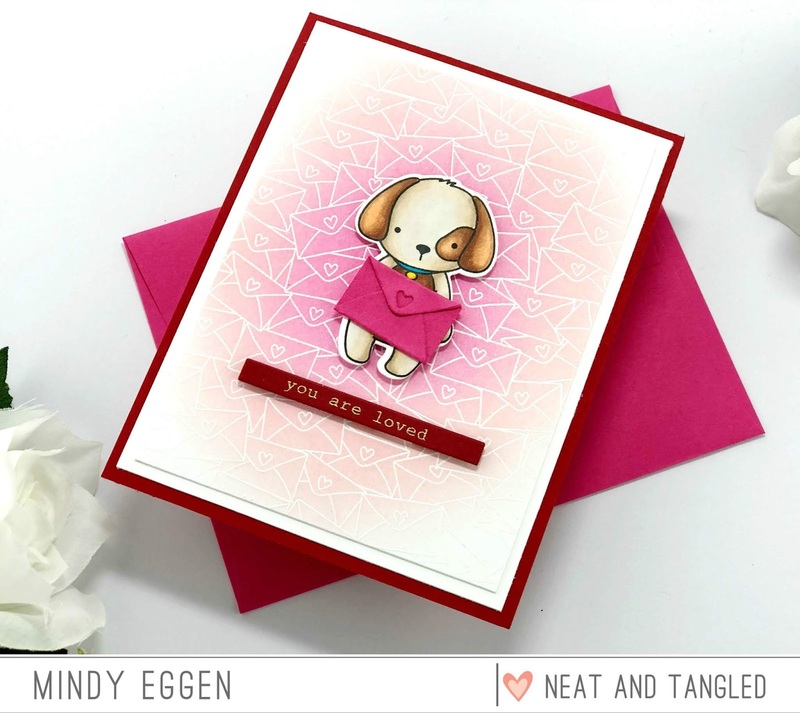 It’s time for the Neat & Tangled February Release. I have a couple cards to share using the NEW Mail Background and Love Mail Dies that will be available for purchase on Friday, February 8, 2019. The Mail Background stamp set is a beautiful red rubber background stamp. I stamped it onto Bristol Smooth card stock with Versamark in and heat embossed with Alabaster embossing powder. Then I ink blended Picked Raspberry Distress Oxide ink in the middle and Tattered Rose. I trimmed the panel down to 3 3/4″ x 5″, matted to a white panel and attached to an A2 size card base made from Red Velvet card stock. I added this adorable puppy from Puppy’s Favorite Things by coloring with copic makers and using the coordinating die to cut it out. My puppy is holding a little envelope that I die cut from Passionate Pink card stock using the Love Mail dies. My sentiment is heat embossed in gold embossing powder onto Red Velvet card stock and trimmed down using a new die that you will see more of later this week called Skinny Strips. For my next card, I once again inked up the Mail Background red rubber stamp with Versamark ink and stamped onto Canson Watercolor paper. I heat embossed with Alabaster Embossing Powder and secured the card stock to a wooden board with purple tape. I spritzed the background with water and sprinkled on Cherry Bomb Shimmer Powder. I spritzed on some more water and then picked up my board and moved the water around. I used my heat tool to dry the water but be careful as to not reheat the embossing powder. Once my panel was dry, I trimmed down to 3 3/4″ x 5″, matted to a white card panel and attached to an A2 card base made from Fog card stock. I die cut the heart using Gold Glitter card stock from the Mail Background coordinating dies and added to the bottom of my panel. My sentiment (another little peek for later this week!) is stamped in Versamark ink and heat embossed with Gold Embossing Powder. I trimmed down using the Skinny Strips die and added to my panel with foam squares. I hope you enjoyed today’s inspiration! Much more to come this week! Be sure to head over the Neat & Tangled Blog for more inspiration and be entered into the Giveaway! Affiliate links may be used at no cost to you. Super adorable cards! That background stamp looks fantastic and I love how you showed a variety of ways to use it!!! What an adorable puppy and I like the mail background on both and the glittery heart. Love how you used the background stamp slightly different between the 2 cards! That puppy is so adorable holding that envelope! I just love both ways you have used this new stamp for your background. They are both gorgeous. And your cards are very pretty! Oh, that puppy is so adorable! The resist background with the letters is fabulous – I'm going to have to get me some of that shimmer powder! many ways it can be used. WOW double hits of inspiration, thank you, do love that super cute puppy. Thank you for sharing. Love the background stamp (with red rubber!)! Awesome cards! The Love Mail dies are fabulous! That pup holding the little envelope is adorable, and the gold glitter heart is so pretty! So cute Mindy! What great cards! I'm excited to see what's next! 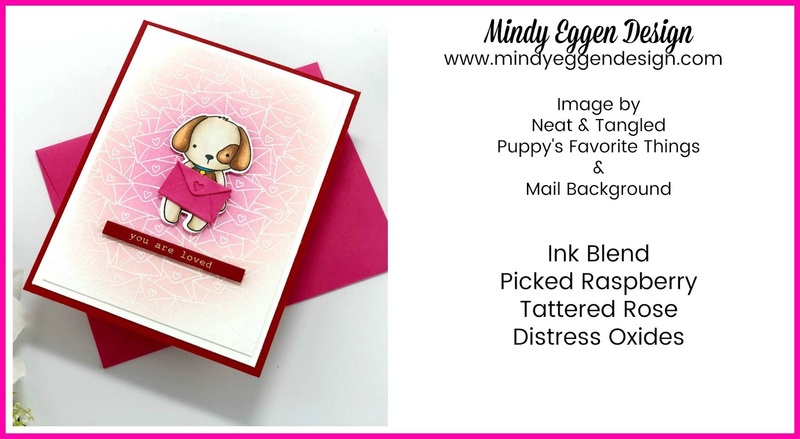 That little pup is adorable and I’m loving how you used the background stamp. Awww!!! Both your cards are totally cute!!! Love the colors!!! Both of your cards are terrific. Love the effect you created with the Shimmer Powder. I'm not familiar with it, but your beautiful card has sold me on it! TFS. Such beautiful cards! I love how the background fades out to the edges on the first one. Adorable pup…love the background stamp. Oh, wow! I love how you did both of these backgrounds with that fab new Mail Background stamp!! Love the sweet puppy card. That background stamp is super cute!! And that little pup is adorable!! I just can't believe your backgrounds. They are amazing–embossing is the way to go, for sure. But your colors!! OH WOW! Love the backgrounds on both! That little pup is just the cutest thing ever!